Disclaimer: This review may contain spoilers and is based on an advanced review copy from Image Comics. When I was 12, I wondered what it would be like to be a witch. I borrowed books on wicca from the library, hiding them from my very Catholic family. I didn’t think about converting–it was an interest born of pure curiosity about beliefs and practices that were completely foreign to me. There was a mysticism that my young mind attached to it, without realizing that it, like other religions, was populated by real people with real worries and problems and struggles. 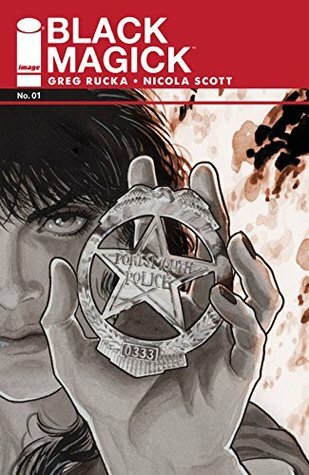 Fast-forward a decade or so, and the first issue of Black Magick not only reminds readers like me that magic, and how one experiences it, can be just as much a burden as a boon. Detective Rowan Black is the reader’s guide, and Greg Rucka establishes the line between her career and beliefs within the first five pages. Rowan practices a belief system that seems to have similarities to Wicca, or at least the layman’s impression of Wicca. We follow along as the coven that Rowan belongs to (as far as the reader can tell) participates in a ritual that is quickly interrupted by the demands of Rowan’s job, depicting one of the internal conflicts that will likely develop in future issues. She’s called away to take point during a hostage situation at a nearby diner, with the hostage-taker demanding to speak to Rowan and only Rowan. While I did find the reason for his demands predictable, I appreciated the quick pace of the story. The reader isn’t made to wait several issues to see Rowan handle magic or address one of the dangers of practicing it. Rowan is clearly aware of her ability to wield magic, and the consequences of using it. We see her trying to gauge the situation and her safety weighing against the safety of the people she’s trying to protect. We see her overwhelmed by the revelation that someone might know what she’s capable of doing, and we see her trying to protect that same person who wants to hurt her. It isn’t martyrdom, so much as it is understanding her limitations and that of other people, and the way those limitations intersect with one another. I am definitely interested in seeing how she deals with those expectations in the next few issues, considering how deadly her actions were in this first installment. As powerful and quick as Rucka’s story is, the art plays a crucial role in setting the tone of the story, and providing a platform for the characters to shine. Nicola Scott’s art isn’t muted by the off-black palette: instead, it highlights Rowan, and important details that hint at Rowan’s state of mind. It may look stark and uninviting to some readers–I’ll admit that my own appreciation for vivid and bright colours meant I was less taken in by the first few pages of Black Magick. But there is a lot to see and notice here, and Scott’s work shines in the little careful additions. Before Rowan enters the diner, we see her exchange weighted looks with her colleagues. Her confusion and calculation is visible in the dip of her eyelids as she speaks to the hostage-taker. The dejectedness of said hostage-taker comes through in the slump of his shoulders and expressiveness of his face. Finally, the only touch of colour comes at the climax of the issue, with Rowan’s eyes glowing in a speckled rainbow panel. It signals to the reader that colour in this story is earned, a moment to be anticipated and appreciated for its rarity, much like the protagonist herself. I look forward to seeing where Rowan Black goes next.